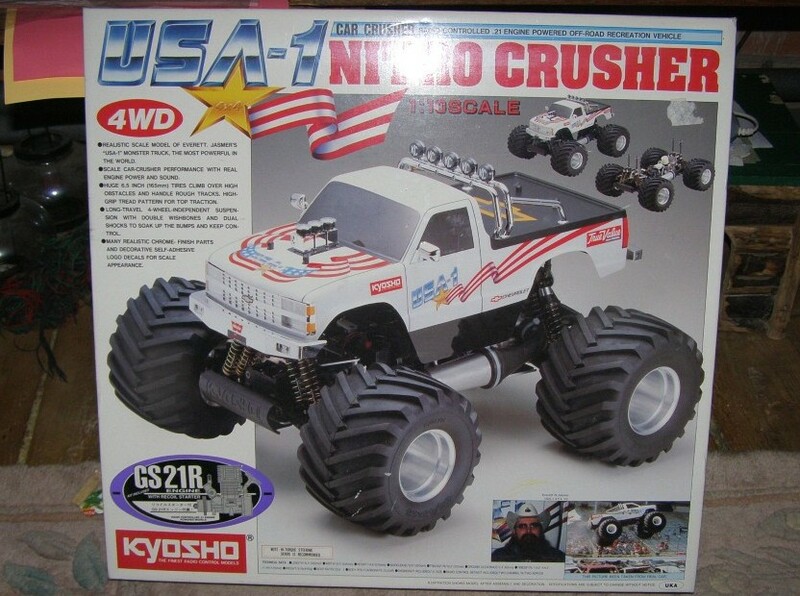 Kyosho | Classic and Vintage RC Cars Kyosho | We are an internet source for classic RC car pictures and information. From vintage vehicles to pre-modern sports cars, you’ll find it here. 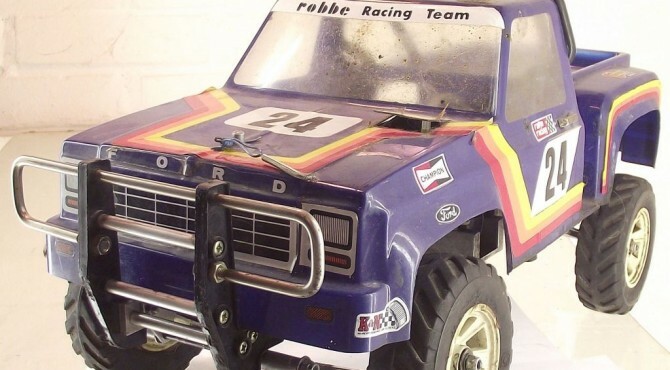 Kyosho made two versions of this 4×4 ‘Bruiser’ type of offroad car in the early eighties (1982/1983). 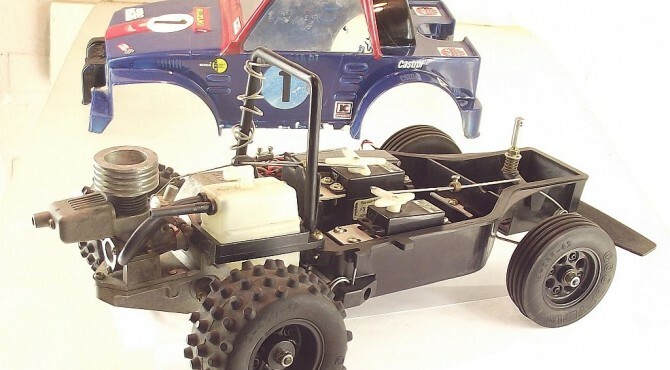 One version was an electrical type with the body of a Chevrolet 4×4 pick-up which had Kyosho item #3008. This electrical version was also available as 4WD Jeep Indiana. The other version had a nitro engine and was available with a 4WD Datsun or a Ford Ranger body. The nitoengine version of the Ford Ranger 4×4 is featured in this article. In Europe these models were sold by Robbe under their own name. Both, the nitro and electrical models, are chain driven 4WD. This is a Kyosho Minitz 06 Buggy ‘Super Jimny’ powered by a 0.61ci/1cc G-Mark engine. In Germany, it was sold in 1982 by Graupner with artikel # 4959. The model is build in 1/12 scale. Many parts from the suspension are in aluminium, the car has oil shocks and a clutch brake. 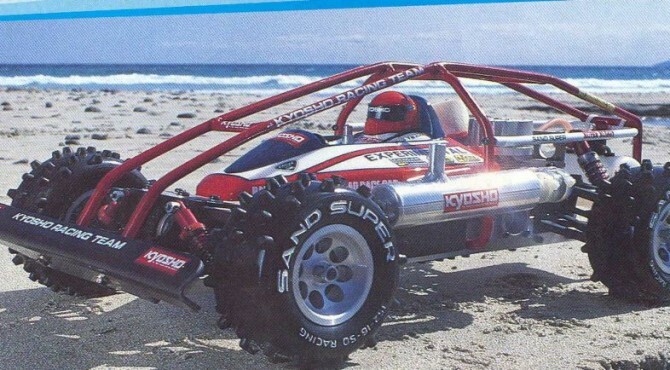 1986, Kyosho Vanning INTEGRA 4WD. 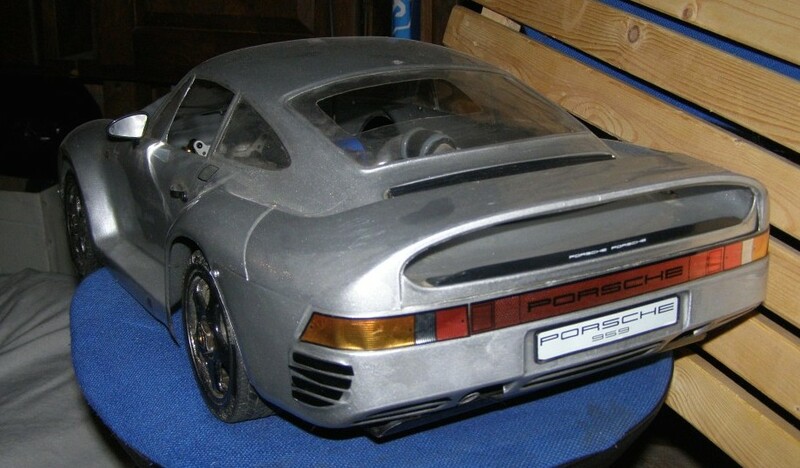 In 1991 Kyosho offered the 1:8 Porsche 959 which was based on a buggy chassis from Hobao called Pirate (RS), Kyosho made only the body and wheels for this model. This unique 1:8 scale on road car, which is really huge, was not designed by Kyosho. Kyosho made the body and wheels only. The first version of the Kyosho Porsche 959 was sold in a black carton box and the model was based on the Hobao Pirate (RS) buggy. 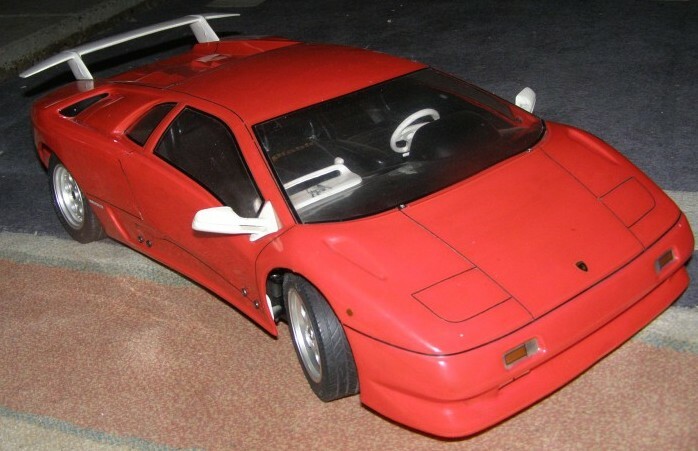 The model was released in 1991 by Kyosho and the chassis was designed by Hobao. 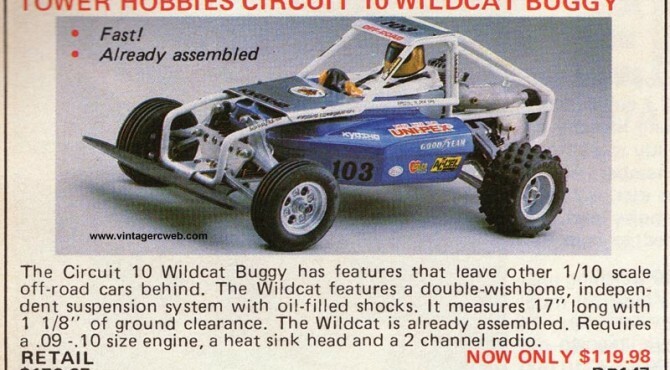 Another version of this car was sold as a buggy under Kyosho name, this buggy was called Prestige 4WD. 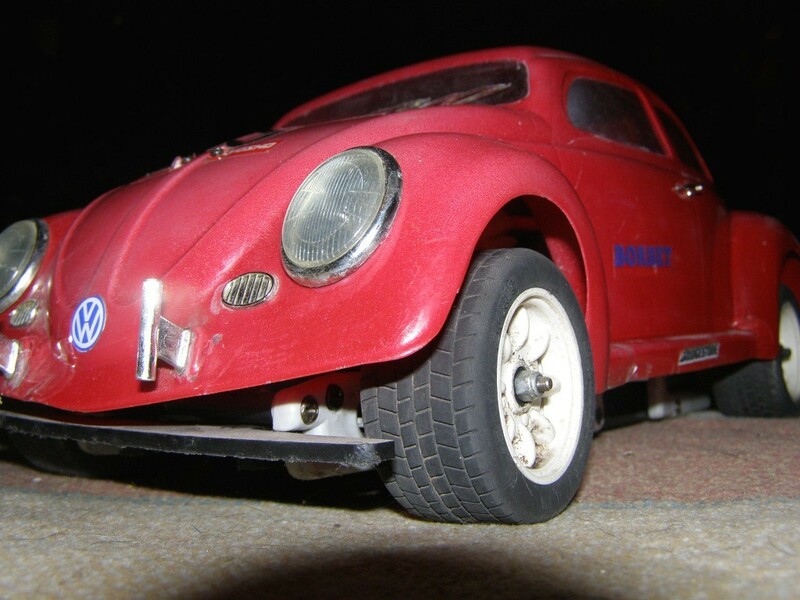 This is the Kyosho Super Alta VW Beetle, Kit no. 3056 from the early ’80’s. The Kyosho Landmax 4WD chassis is based on a proven four wheel, shaft driven system, taken from Kyosho’s 1:8 competition off-road buggies. Features include three gear differentials, four long stroke oil filled shockdampers and four wheel independent suspension. Power is provided by an included GS-21R pullstart engine, which is pre-fitted to the partially assembled chassis. A fan assembly helps to reduce engine running temperature for improved power output. Precision ball bearings are included in the main transmission to help reduce friction and wear. 1970: The Kyosho DASH 1 is presented at an Aircraft Pageant at Harumi International Trade Center sponsored by Mitsuboshi Shoten. Three professional racing drivers were invited to run the DASH 1. It was in 1970 that Kyosho started selling the DASH 1. 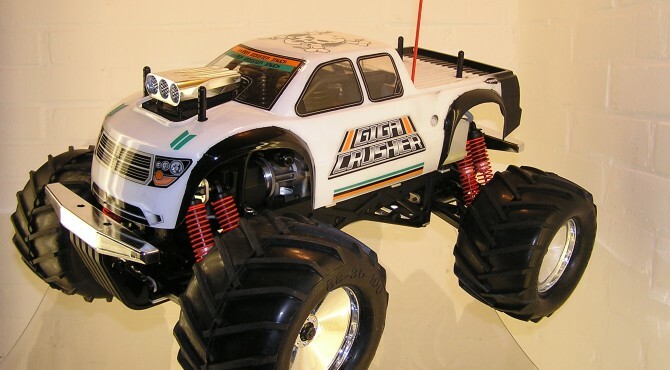 The DASH 1 is generally agreed by the industry to be the first RC car made in Japan. The three body styles chosen were the most popular racing machines in the Japanese Grand Prix: Porsche 917, Lola T70 and the McLaren Elba. The bodies were vacuum molded, a totally new innovation in RC at the time. Mr. H. Suzuki (then President of Kyosho) was the one who set about looking for a vacuum molding factory. 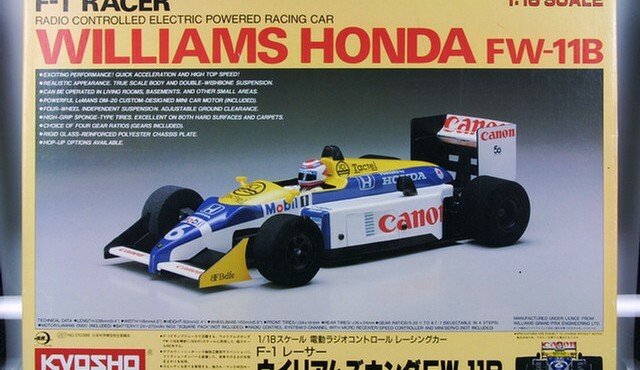 Williams Honda FW-11B – 1/18th scale F-1 racer. Kyosho Kit No.3177. Also available as Kyosho Kit No. 3175 Lotus Honda 99T and as Kyosho Kit No. 3176 McLaren MP4/3 TAG Turbo. The Kyosho ‘Hoppin Mad’ Wheelie Action is quite light and pretty fast for as small of an engine ( .10ci) as it has. A very unusual rc model. Kyosho made them in electric and gas version. It came preassembelt. With Sonic Sports Kyosho has created one of the most successful 1/12 scale race cars, at least when it came to sales. Is based on a modular system that can be fitted based on a same chassis, with different axes. There are for both the front and the rear driven and non-powered versions. Kyosho developed this 1/4 scale R/C model to accurately reproduce the design and performance of original high-performance Kart. 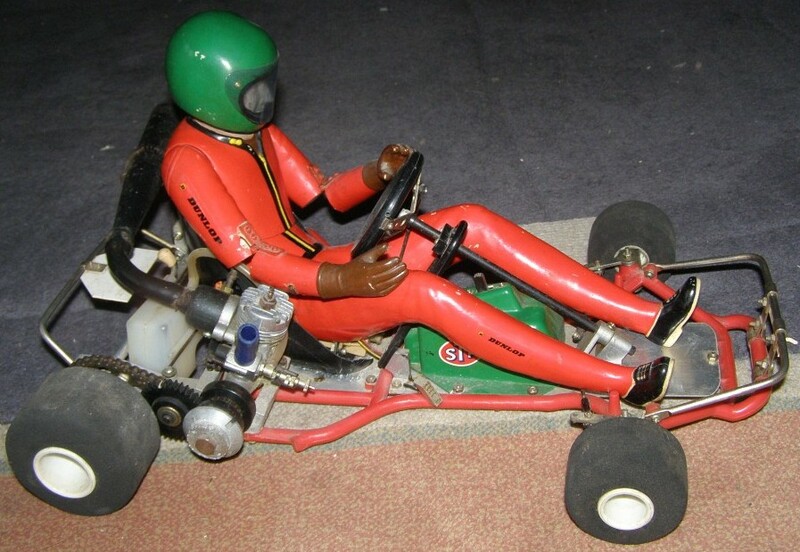 The model in the pictures is the Graupner (European) version of the Kyosho Go Kart, produced in the early ’80’s and sold in Europe by Graupner as Go Kart 10. This European model did not have ‘side-pods’ and front steering cover of the Kyosho Racing Kart 10 and the driver was made of hard plastic. The steeringservo is placed under the ‘bum’ of the driver and activates the steeringwheel. With this direct steering control like a true racing kart, this machine offers a fascinating driving experience, completely different to standard R/C cars. The Kyosho Circuit 10 Wildcat Buggy has features that leave other 1/10th scale offroad-cars behind. The Wildcat features a double wishbone suspention system with oil-filled shocks. It measures 17″and has 1 1/8″ of ground clearance. The Wildcat came already assambled. Required a 0.9 – 1.0 ci engine, a heatsink head and a 2-channel radio. 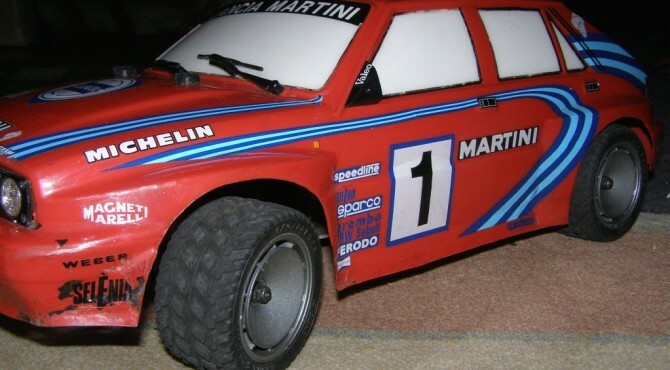 Kyosho Radio Controlled 10 engine powered 4WD Rally Car – Lancia Delta integrale 16V – Kyosho Kit No. 3044. 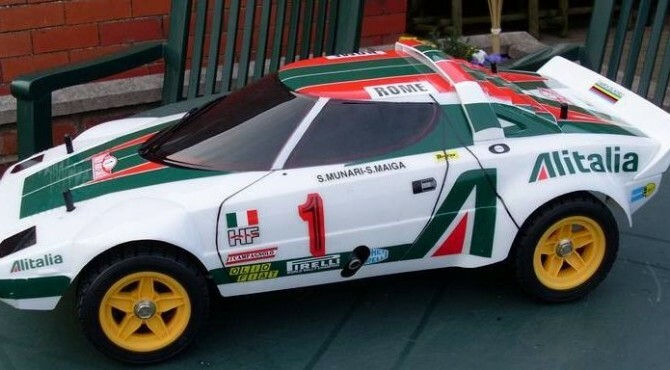 Exiting true-scale RC Lancia Delta rally car. High performance with powerful .10 engine and high-traction four wheel drive. All major mechanical parts factory assembled for easy preparation. 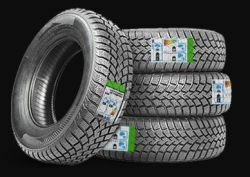 Effective wichbone/arm all-independent suspention with oil filled shocks for top handling on all surfaces. Super-easy starting with recoil-type starter. Efficient, reliable drive system with shafts and triple differentials. This car is the 1967 Monte Carlo Rally winning Cooper 1275 S driven by the Finnish driver Rauno Aaltonen. 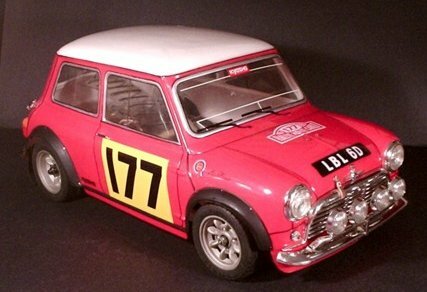 1967 was the last of 3 official Monte Carlo wins by a Mini. The engine compartment looks good and given that this model has been around for nearly 30 years, it is very nice indeed. 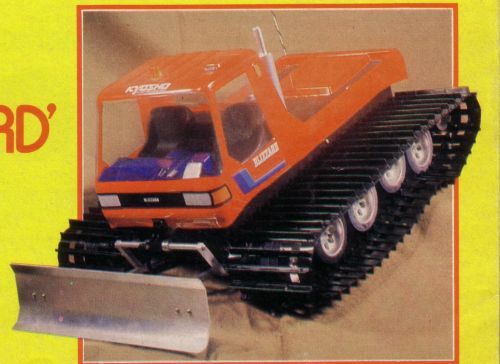 The Kyosho Blizzard of 1982 was also marketed as Graupner Pistenbully in Europe. 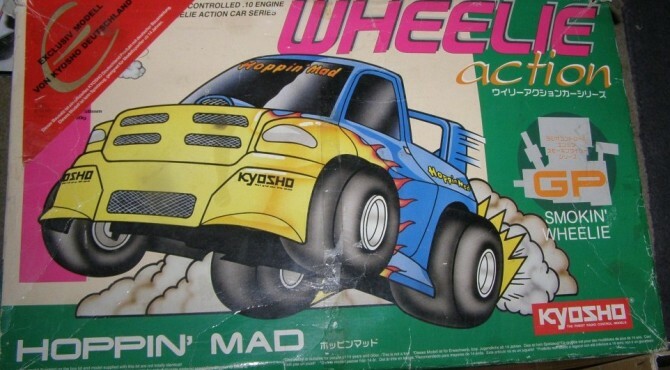 Kyosho did introduce the original version in 1982. The Blizzard/Pistenbully was produced by Kyosho in the 80s and distributed by Graupner in Germany. It’s a 1/12 scale replica of the Kässbohrer PB170D/DR from 1976. 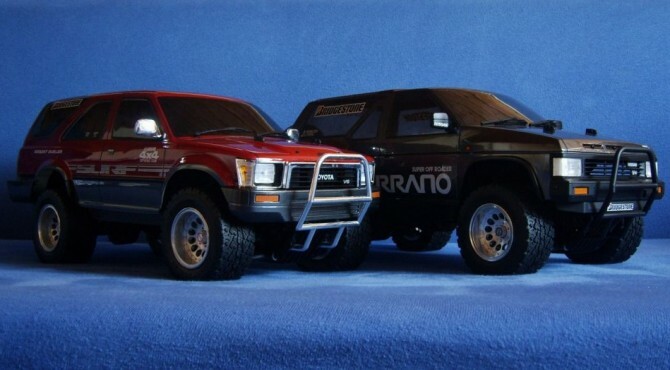 Kyosho offered a nitro version and electro powered version. 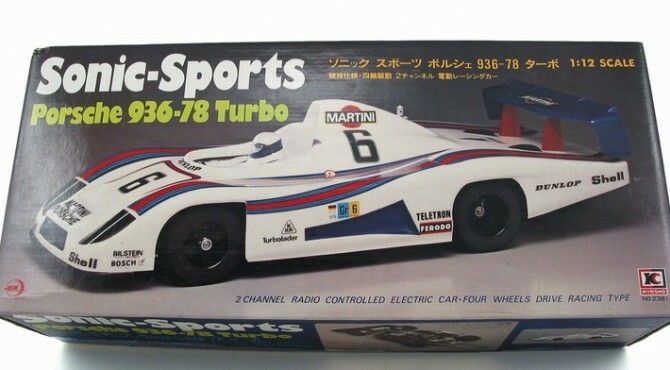 The 1982 model was primairly available as electro powered version, later Kyosho introduced the nitro engine powered version. As option part it had a moveable shovel and a moveable rolling drum on the rear, operated by two seperate servos which both could be controlled by a third and fourth channel on the remote control.